Tag Archive | "puerto princesa city"
Stakeholders attentively listen to presenters while noting down points for discussion thereafter. 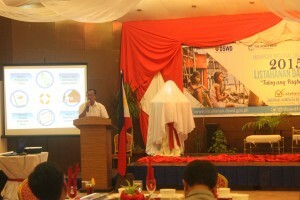 Puerto Princesa City, Palawan – Five government agencies gathered in response to an initiative by the Department of Social Welfare and Development IV- MIMAROPA to conduct a consultation dialogue with the Local Government Unit and Stakeholders of Puerto Princesa City in the implementation of Republic Act No. 9442 known as “Magna Carta for Persons With Disabilities”, last July 10, 2013. The consultation dialogue was in favor of presenting the guidelines in implementation of the RA 9442. 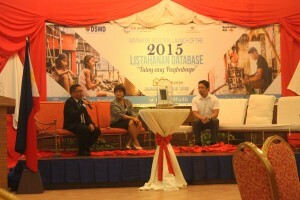 Delegates from the DSWD, Department of Health (DOH), Department of Labor and Employment (DOLE), Department of Public Works and Highways (DPWH) and Department of the Interior and Local Government (DILG) took turns in presenting laws and programs to be implemented by their respective department. The RA 9442 which benefits the welfare of persons with disabilities was an amendment of RA 7277. The Act highlights the 20 percent discount and other special privileges provided to PWDs at drugstores and establishments such as restaurants, theatres, cinemas, amusement parks etc. A comprehensive discussion on specified orders in accordance with RA 9442 underlined the first half of the consultation dialogue. The rest of the day was solely dedicated to an open forum participated by attendees from various associations of PWDs and other concerned stakeholders. One section of the Act that states the reduction in tax obligations of a person taking care of a PWD was put into question by Municipality Budget Officer of Quezon, Palawan, Mr. Eddie Luneta. He proposed that the same regulation should apply for employed PWD. Luneta further implied how having to take care of a person with disability and having the disability yourself bear no difference in the degree of burden therefore concluding the specific regulation should apply to an employed PWD himself. This concern was quickly addressed by Ms. Geneliza Gabilan, DSWD IV-MIMAROPA’s focal person for PWDs, validating the 25% tax reduction on the gross salary total of an employed PWD. As the forum progressed, one beneficiary complained of some drugstores’ refusal to provide a 20% discount on purchase. Gabilan explained that a beneficiary should first be legitimately registered as a PWD. That means undergoing the process of acquiring an ID needed to present to any drugstores and/or establishments that a PWD has benefit from. The process includes obtaining a medical report from a government hospital to identify the kind of disability a person has. The medical report will then be used to check if the type of disability a person has, qualifies for the kind of protection RA 9442 gives. The session concluded with a few concerns left to be confirmed. That includes the 1% of the total municipal budget that is supposedly allocated to development programs for PWDs and Senior Citizens. Also, a few clarifications are yet to be discussed in reference to the percentage of tax reduction of an employed person who has a PWD for a beneficiary. These concerns will be looked into by the concerned government agencies and a promise of a timely response has been set.